Summary and Definition: The Chippewa tribe are also referred to as the Ojibwe, Ojibway or Ojibwa in Canada. The Chippewa (Objiwe) tribe originally occupied a vast tract of lands around Lake Huron and Lake Superior and south in Michigan, Wisconsin, and Minnesota when their lifestyle was of the Northeast woodland cultural group. They were hunters, fishers and farmers. Their fierce, warlike reputation and their sheer numbers made the Chippewa one of the most feared tribes. They extended their territories across a massive are and many adopted the lifestyle of the buffalo hunters of the Great Plains. What was the lifestyle and culture of the Chippewa tribe? The warlike Chippewa tribe were the largest and most powerful tribe in the Great Lakes area. The French established New France in the 1600's and established trading links with the Chippewa who they referred to as the Sauteux. Like most of the Algonquian speaking tribes they became strong allies of the French fighting against the English and the tribes of the powerful Iroquois Confederacy. The Chippewa expanded their territories to control most of lower Michigan and southern Ontario. Succeses in tribal warfare and increased trade led them to expand their lands still further. Many of the people settled on the Great Plains. The Chippewa tribe adapted to their changing environment adopting different lifestyles and cultures during their migration. In 1769 the Chippewa formed a confederacy known as "The Three Fires" with the Ottawa and Potawatomi tribes aimed at forcing the Peoria tribe from the Illinois River. In 1785 the Chippewa joined the Western Confederacy that consisted of a league of many different tribes including the Potawatomi, Ottawa, Shawnee, Delaware, Kickapoo, Huron and the Seneca tribes. The goal of the Western Confederacy was to keep the Ohio River as a boundary between Native American lands and the United States. There were no wars between the Americans and Chippewa after 1815 and the majority of the Chippewa remained in their homelands in the United States and Canada. What language did the Chippewa tribe speak? The Chippewa tribe spoke in a related dialect of the Algonquian language. Their name means "Original Men" in their own language. The Algonquian name for them 'Ojibway' was later corrupted by the English as "Chippewa". They were known to the French as the Sauteux or Saulteurs meaning "People of the Falls", in reference to the place of their residence about Sault Ste. Marie on the St. Marys River in Ontario, Canada. The a name still applied to them by the French Canadian. The above picture depicts Sha-co-pay, meaning "Six", who was a distinguished chief of the Plains Chippewa. It was painted by the famous artist George Catlin (1796-1872) at Fort Union in 1832. George Catlin described the chief as a huge, proud man. His buckskin shirt is beautifully embroidered and painted with symbols representing his battles and his life. His hair is decorated with eagle feathers and hair pipes and he wears a beaded choker necklace that was unique to the Chippewa (Ojibwe) and Cree tribes of the northern plains. 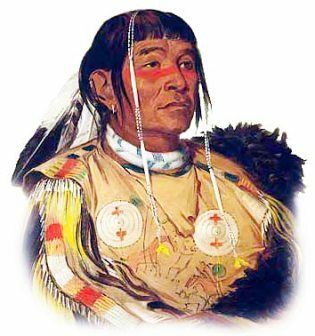 Chief Sha-co-pay was a great warrior and his battle trophies in the form of small scalp locks taken from his enemies - refer to practise of Taking Scalps in Indian Warfare. Where did the Chippewa tribe live? The Chippewa were originally people of the Northeast Woodland Native American cultural group. The geography of the region in which they lived dictated the lifestyle and culture of the Chippewa tribe. What clothes did the Chippewa wear? The pictures on this page show a variety of the different types of clothes worn by the Chippewa tribe that were dictated by climate and customs. The Chippewa wore breechcloths in the summer and in cold climates they wore fringed, decorated tunics, high moccasins and leggings. The women wore wraparound skirts or buckskin dresses. Warm robes or cloaks were also worn to protect against the rain and the cold. Clothes were decorated and colored with red, blue, yellow and green dyes. 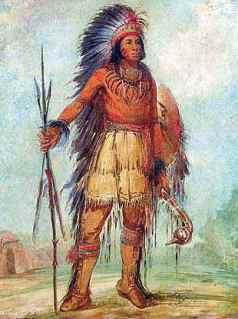 The George Catlin picture depicts a Chippewa warrior called 'A-wun-ne-wa-be', meaning "Bird of Thunder". He is wearing the full regalia of a Plains Indian with a magnificent feather war bonnets with a long trailer of feathers that was worn as a symbol of honor and accomplishment. The war bonnet consisted of a band decorated with eagle feathers, ermine fur and beadwork with feathers trailing to the floor. The Chippewa men were skilled fishermen and boat builders. The Chippewa who had lived around the Great Lakes built birchbark canoes for hunting and trading expeditions and for transportation of their war parties. The Chippewa hollowed out logs and stripped the bark from the trees. The birch bark was stretched over a strong, lightweight, wooden frame to make a birch bark canoe that could be easily manoeuvred and steered. The ribs of the canoe were made of strong hickory, cut into long, flat pieces, and bent to the shape of the boat. The Chippewa (Objiwe) canoes measured about seven metres long and one metre wide and could carry four or five men and about 91 kilograms of cargo. The light, speedy birchbark canoe was perfect for travel along fast streams, rivers and shallow waters and were also sturdy enough for rough waters. What did the Chippewa tribe live in? The Chippewa tribe lived in lived in several different types of shelters, the most common being the Wigwam, a form of temporary shelter that was used by Algonquian speaking tribes who lived in the northeastern woodland regions. Wigwams were small cone-shaped houses with an arched roof made from wooden frames that were covered with sheets of birchbark and woven mats that were held in place by ropes or strips of wood. Chippewa wigwams were also covered with buffalo hides when they migrated to the Great Plains. Wigwams were usually about 8-10 feet tall and 10 - 15 feet wide at the base. What food did the Chippewa tribe eat? The food that the Chippewa tribe ate depended on the natural resources that were available to them in the locations that they lived in. What weapons did the Chippewa use? The weapons used by the Chippewa (Ojibwe) tribe included bows and arrows, a variety of different clubs including the Bird Head club, hatchet axes, spears, lances and knives. The rifle was added to their weapons with the arrival of the European traders. Chippewa History: What happened to the Chippewa tribe? The following Chippewa history timeline details facts, dates and famous landmarks of the people. The Chippewa timeline explains what happened to the people of their tribe. 1600s: The Chippewa (Ojibewe) tribe lived in the northern Great Lakes Region and numbered over 100,000. 1634: A devastating epidemic of smallpox are spread by the Europeans. 1687: The Chippewa expanded to the south, east and west. 1701: The Chippewa controlled most of lower Michigan and southern Ontario. 1737: The Dakota uprising against the French. The Chippewa fight with the French. 1769: The Ottawa, Chippewa and Potawatomi form the 'Three Fires' confederacy and force the Peoria tribe from the Illinois River.